Jaguar has a hit on its hands with the XF. It's been around since 2008 yet it remains as modern today as it was way back then. Different option packs, various updates and revised engine line-ups have been appearing regularly to maintain buyer interest. This has worked with the market readily accepting the variations as they have arrived. Full marks to Jaguar for recognising the need to stay relevant, especially with engine choices. 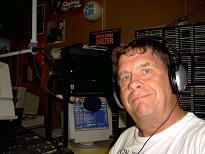 In the prestige segment there is conflicting demands for power. Some prefer 'steady as she goes' with good fuel economy, others prefer good performance with reasonable economy, whilst others want pure performance. 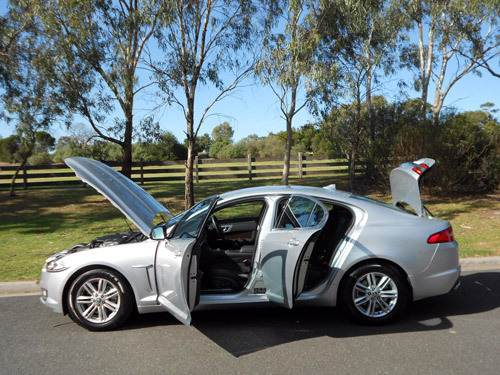 Jaguar cater for a wide variety of tastes with the XF, especially as it relates to the powerplant. The most recent addition to the engine choice locally is the 2.0 litre petrol-fuelled 4-cylinder engine. We couldn't resist a 'run' in this car. 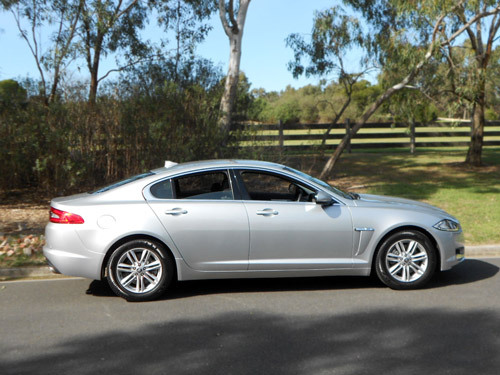 Rhodium Silver for the exterior with a Charcoal/Charcoal Suede cloth interior was the way our Jaguar XF Luxury 2.0 i4 Turbo came presented for our drive experience. The base price* for our test car was $68,900*, plus options. This made the total price* of $70,220* for our drive car (excluding the traditional on-road costs). We were impressed by Jaguar's pricing strategy. 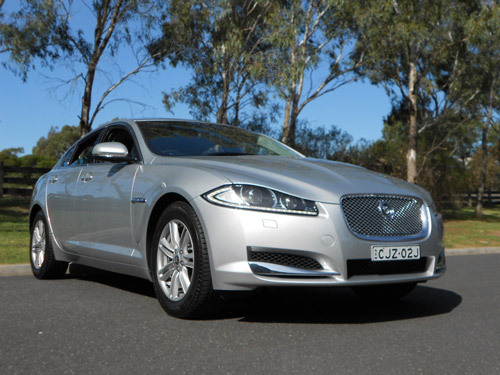 Jaguar has worked wonders with the specifications to ensure an ever expanding cover of the market occurs with the XF. A shade over $70K and a staggeringly delightful car is the result. The line-up of sedans include XF Luxury, XF S, XF Premium Luxury, XF Portfolio, XFR and, coming soon, the XFR-S. Engines include the 2.0 litre i4 177kW Turbocharged Petrol (as fitted to the test car), 2.2 litre i4 147kW Turbocharged Diesel, 3.0 litre V6 177kW Turbocharged Diesel and a 3.0 litre V6 250kW Supercharged Petrol. The XFR and XFR-S come with a look-at-me-go 5.0 litre V8 375kW supercharged petrol-fuelled engine. Numerous options are available to enhance the XF. The test car's 2.0 litre supercharged petrol-fuelled engine provides 177kW of power (at 5,500 rpm) and 340Nm of torque (at 2,000 to 4,000 rpm). The automatic transmission is an eight-speed unit. An obvious observation with this Jag is the typical quietness that is associated with the natural ambience of the famous British brand. Whilst we were on the road, we were continually thrilled by any opportunity to demonstrate the delight provided by the accelerator from a standing start. We didn't have to 'floor' the go pedal to reveal how delightful this package was presented. Yet on several occasions with a passenger onboard the passenger would comment about the amazing performance emanating from the 2.0 litre engine. It must have been my honest face that reassured them that it was, indeed, just a two litre displacement in the four cylinder engine. Otherwise an element of scepticism would have been justified. The ride was admirable. So, too, were the driving dynamics. 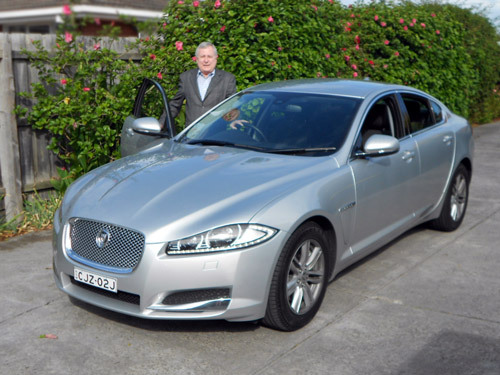 This Jag spoils occupants! We enjoyed this car so much, we gave it 418 kms worth of our company. In return, the Jag gave us 418 kms of quality motoring. It's guessing competition time. 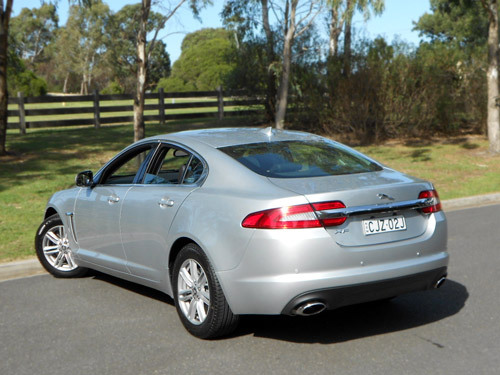 How would you rate the acceleration of an XF with a two-litre four-cylinder engine. Did you say ten seconds for a routine dash? Would you believe 0-100 km/h in 7.9 seconds? That explains why we were thoroughly delighted, but equally amazed with this XF. Be assured, this four-cylinder has received the Jaguar magic treatment. I am sure many a motorist will be thrilled with such performance, coupled with the obvious trappings expected with a Jaguar. The comfort level upfront is quite good in my opinion. 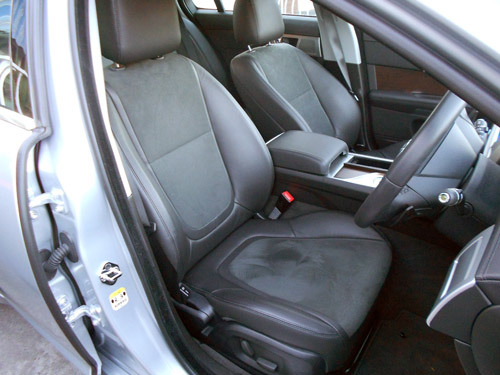 Easy to adjust seating, same with the steering column. You just feel so much at home with the leather and the ambience that reflects traditional Jaguar qualities. Dynamic Stability Control is standard, as is two-stage airbags for the driver and front passenger, as well as side and curtain airbags (controlled by a sensing system that ensures deployment occurs only if the seats are occupied). 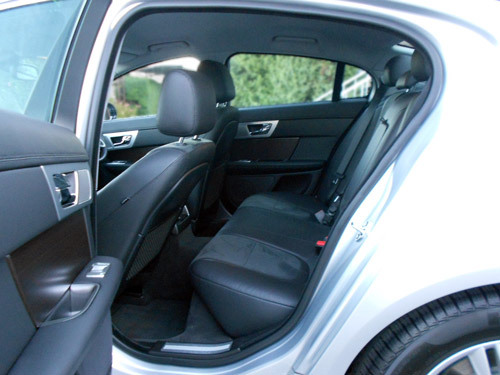 An anti-whiplash system moves the front head restraints forward if there is an accident. The body shell has new-generation high-strength steels. The combined cycle fuel consumption rating for the 2.0 litre petrol automatic is 8.9 l/100 km. Our average of mostly urban driving was 11.3 litres/100 km. The rated fuel consumption, on the urban cycle is 13.4 l/100km. So our average demonstrated quite a reasonable figure. Our average speed for the 418 kms was 33 km/h which reveals too much time stuck in urban traffic! But that's the way it is in big city Australia. The fuel tank has the capacity of 70 litres. Emissions of CO2 are rated at 207 grammes per 100 kilometres on the combined cycle. 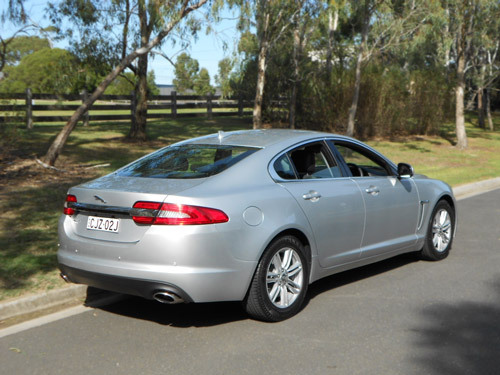 A braked trailer (and its contents) can weigh as much as 1,850kg for towing by a Jaguar XF. An unbraked trailer should weigh no more than 750kg. Appropriate towing equipment is required, of course. Jaguars are covered by a warranty lasting three years/unlimited kms (with conditions). Roadside assistance is available for the warranty period (conditions apply, of course). An Extended Warranty Insurance scheme for 12 or 24 months (up to 200,000 kms) is also available (for new cars only). 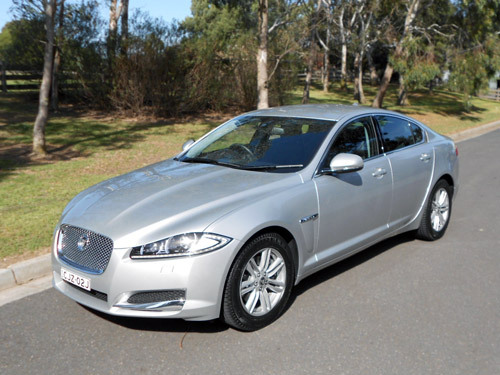 You need a superlative searcher/selector to sum up the Jaguar XF 2.0 sedan. It is a wonderful car, so smooth and quiet with readily available performance that must be rated as remarkable for a four cylinder engine in a car this size. When an adequate superlative is invented it will be posted here. Don't be a doubter. If you are shopping for a premium sedan about the size of an XF you need to drive this car. By the way, I suspect there are three German brands that do not want you to drive this car! And, yes, the price we mention in the story is correct. It's amazing value.